I think anyone wants to pamper themselves after a toxic, stressful and hard days work. There are times that we can not go to the spa, derma or salon, for whatever type of reason. Here are some tips to share that I hope could help maintain your natural looks that is easy on the budget. For face; try to buy some microdermabrasion cream that you could used as an at home facial spa. You could use the product once to twice a week to exfoliate dead skin cells and brighten with a new one. Just read the labels for more instruction. I know this cost one to two thousand pesos. For some , it's cost much , but it's worth it for your face to look luminous and radiant without wearing make up. After all, it's your natural beauty to enhance and prevention is much easier than treatment. 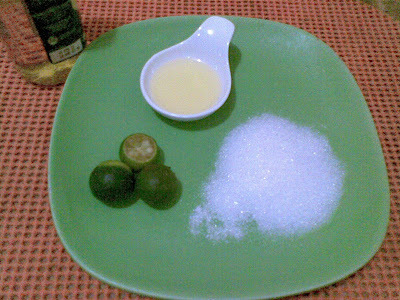 For the body; as an exfoliant, try 3-4 tablespoon of sugar and half teaspoon of olive oil and mix together and olaaah! you could use it as a sugar scrub! Just spread to your body in a circular motion concentrate on the thigh, elbow and knee area, ( you can also used this as a footscrub, to spare you from going to the salon - for footspa. ) or whatever rough patches on your body that's easier to get dry. For ultimate result to lock in moisture lost when you exfoliate, try to have a milk spa/ bath by using evaporated milk ( try to use full cream type ) place in a container, half part of the can and squeeze some calamansi or lemon extract, to lighten your skin. Spread this to the entire body and leave for 15 minutes, then rinse your body thoroughly. Using of intensive body cream like; body butter or body souffle is a must after showering to maintain it's moisture! However, if you do not have enough budget, regular lotion would do. I recommend to use this once a week - For at home spa ambiance, try to put some scented oil or candles at your bathroom for serene mind and body relaxation. I hope this post could help you to look and feel good about yourself. I just rely on a moisturizer cream and a trip to a spa once in a while. I don't want to put too many chemicals on my face because I want to retain the oil on my face.An oily face can combat the ageing process.